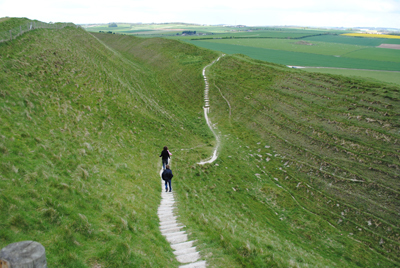 Located just outside the town of Dorchester in southern Dorset to the south-west of London, Maiden Castle is the largest extant Iron Age hillfort known to have been built in Britain and among the largest and most complex in all of Europe. Featuring multiple earthen ramparts (pictured above is the ditch between two of them) – from the top of which you can see spectacular views of the surrounding countryside – and well-defended entrances, it would have once been home to several hundred people. It’s been speculated the name may come from the Celtic word “mai-dun”, meaning a great hill. The first archaeological excavations were carried out here in the 1930s by Mortimer Wheeler and then later in the 1980s. Initially built between 800 and 550 BC, the first Iron Age hillfort – built on the site of an earlier Neolithic enclosure with settlement dating back some 6000 years – was enclosed by a single rampart. In the middle Iron Age, between 550 and 300 BC, it was extended to some 19 hectares or 50 football fields and, apparently densely populated with “round houses” which over time were organised into an increasingly regimented layout, eventually become the pre-eminent settlement in southern Dorset. In the late Iron Age, the settlement became focused on the eastern end of the fort and with the arrival of the Romans and their establishment of the town of Dorchester (Durnovaria), it was finally abandoned. Among the features identified within the hillfort’s precincts are well-defended and complex entrances at the western and eastern ends and a large Iron Age cemetery just outside the eastern entrance. Discovered by Sir Mortimer, the cemetery contained more than 52 burials, some of which held the remains of males with terrible injuries. While Sir Mortimer believed it was a war cemetery created following a battle between the locals and the Roman, it is now thought to have been used as a more general cemetery over a longer period of time. 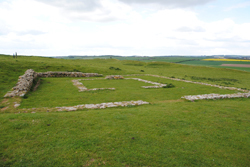 The remains of a Romano-British temple (pictured above right), dating from the late 4th century AD – about 200 years after the site was abandoned, has also been found inside the hillfort’s boundaries. It consisted of a central room surrounded by a passage with a portico open to the weather. Nearby is what is believed to have been a shrine and a two roomed building thought to have been a priest’s house. A bronze plaque depicting the goddess Minerva has been found on the site, suggesting the temple have been dedicated to her. The site is managed by English Heritage who have an MP3 audio tour you can download from the website and play on an iPod, smart phone or MP3 player to give an extra dimension to your visit! For more on Iron Age Britain, check out Barry Cunliffe’s Iron Age Britain (English Heritage) .